No one wants to be forgotten. Some believe that being remembered is not simply a way to respect those who came before you; it is also a way to keep those people alive for future generations. And when our lives are ones we can be proud of, it becomes our legacy, our priceless gift to those who come after us. Most of us live simple, ordinary lives that touch our immediate family and friends, and this simplicity is our legacy. But there are some who live expansive lives and leave bigger footprints. These are the rare people who are destined to have a significant impact beyond their immediate family and friends. These are the rare people who stand up to life’s challenges and transform their own circumstances, as well as their own communities, in immeasurable ways, and for this they deserve our respect and recognition. These are the rare people who leave impressive legacies that show a life well-lived has generational impact and historical significance. 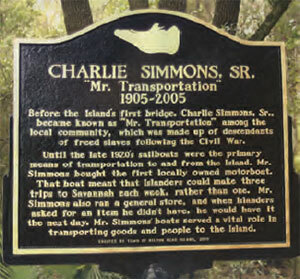 Charlie Simmons Sr. was one of those rare people, and this is the legacy he has left for the proud Simmons family, and the Hilton Head community. When you drive down Hilton Head Island’s Spanish Wells Road, you are sure to go over the bridge that was named after Charlie, also known as “Mr. Transportation.” The story of how he used his boat to connect native islanders to the mainland is a well-known one. He established a ferry business that enabled native islanders to bring their crops to the markets in Savannah. Not only did his transportation business impact the lives of the individual islanders, it was also instrumental in increasing the economic strength and overall development of the island. This makes his life and work an important part of Hilton Head’s history.